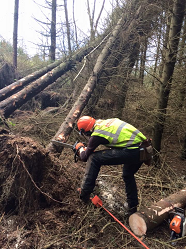 We have a vast array of experience dealing with storm damaged and windblown trees. 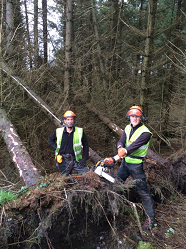 Working closely with Leicestershire county council highways we have become efficient and experts at tackling these most dangerous of trees with great care. 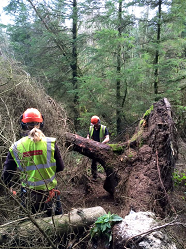 Using our 4 tonne winch, we are able to winch the root plate back into place. 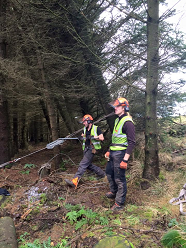 Our team are fully trained and qualified in processing both singular and also multiple windblown trees, holding the relevant Lantra qualifications. 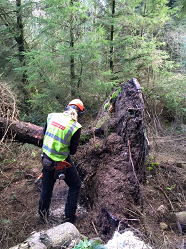 We can also organise and offer crane operation services in emergency dismantling of storm damaged or fallen trees. We have an extensive range of equipment and tools meaning that we are readily able to tackle any job offered our way. 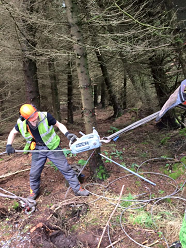 Safety of our team is our primary concern and all of our equipment is kept up to date and regularly checked using government guidance and safety standards governed by LOLER and PUWER.